Topic: What female character(s) have I had crushes on? Hm. Tricky topic. I can admit to, in junior high especially, feeling pangs of longing for certain girls in the books I was reading, but these didn’t really last beyond the pages of the book. It was less that I thought they would be a great girlfriend for me in real life and more that I thought they were paired well with the book’s hero, and I wanted the romantic couple to be together at story’s end. Still, this was often because there were real qualities I liked in the girl, and I suppose that when my young self imagined what my perfect future girlfriend would be, some of the qualities of these literary girls may have found their way in to that image. So I reflect now and try to think of the ones who attracted me most, and who I was most loathe to leave upon reaching the book’s end. One in particular stands out from the reading of my youth. I was surprised, because I often forget about this character. She’s not Eilonwy, from The Chronicles of Prydain, who, though possessing the inestimably attractive qualities of being a cute redhead, passionately affectionate, and stubbornly loyal, is nonetheless a bit too flighty and prone to too drastic mood swings for me. Nor is she a lofty Lúthien, too beautiful and ethereal a creature to ever notice a common boy like me. But she is a princess. In her wisdom, wit, conscientiousness, and utter, wild beauty of spirit, she is as dazzling a princess and as firm a friend as any boy in any realm, real or imaginative, could hope for. To my fifth grade self, she was something akin to The Perfect Girl. 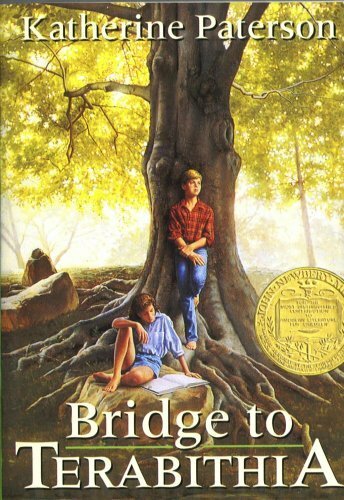 She was Leslie Burke, from Bridge to Terabithia, by Katherine Paterson. Leslie is an Adventure Companion, one of the best a boy can hope for, especially a lonely, introverted boy. It is she who sees Jesse for who he is and determines to befriend him. It is she who pulls him into Terabithia, an imaginary kingdom of monsters and people to protect from monsters, that is both an escape from the troubles of the world and a training ground for how to deal with them. Even though she takes the lead in most of their adventures, she doesn’t lord over Jesse or boss him around. She encourages his artistic talent and is delighted to combine his drawing skills with her storytelling ability. This is a girl who can do just about anything as good as a boy, and often better, but never brags, never lords it over him, never humiliates. She has her head in the clouds, but her eyes squarely on the people around her; as immersed as she is in Terabithia, the world of her imagination, she never forgets them. She loves justice, and justice means helping people in need. Oh, and she loves The Chronicles of Narnia. I only read this special book once, but I can remember the sickening feeling in my gut when I realized, slowly, and along with Jesse that Leslie had really died in that accident. It was hard to accept. When Jesse went into denial, I was right there with him—she had to come back, right? She was just too wonderful to be gone for good! But not this time. Jesse and I had to accept this, and move on. And we are able to, because of the strength Leslie gave us. Just imperfect enough to be obtainable and relatable, just perfect enough to be absolutely wonderful, Leslie Burke was a girl who would stick with a boy and have the best adventures with him, and would be his perfectly-matched companion as they both mature into adulthood. So that’s my childhood crush. The tragedy, of course, is that Leslie never gets to live into adulthood. So, thinking of a literary girl I might have a crush on now, if she were real, I set quickly upon a very recent acquaintance: Gwyneth from The Bell at Sealey Head by Patricia McKillip. Gwyneth is a reader and a writer, and she instinctively comes to these activities with a passion and thoughtfulness that immediately kindled in me the recognition of a kindred spirit. She is sensitive, kind, creative and yet practical, elegant in spirit yet still very down-to-earth, and she likes humble and chivalrous men. She also is strong and mature enough not to let her aunt and friends’ silly class obsession be a real obstacle to her love for Judd. If I couldn’t be in love with her, I’d at least want her as a close friend.